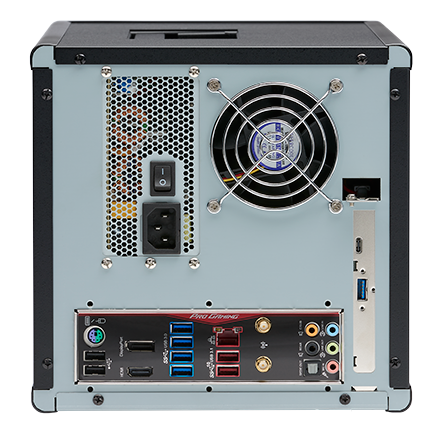 The Digital Intelligence μFRED system has the forensic case processing power of larger, more expensive systems in a form factor the fraction of the size. The μFRED includes an Intel six core i7-8700, 3.2 GHz CPU with 12 GB cache. Three storage drives for the OS, database/cache/temp, and case data are standard. Fourteen different USB connections provide expansion flexibility. Network data transfers are fast and efficient with an integrated gigabit Ethernet connection. Integrated WiFi and Bluetooth provide additional connectivity. Scaled down in size but not processing power, μFRED’s offer the performance of a higher end system at an entry level system price. Don’t overpay for performance. If you need the quality and performance that come with FRED systems at a budget friendly price, the Digital Intelligence μFRED should be high on your list. Need to change your work locations from time to time? Grab the handle on top of the μFRED case and go. The handle folds flush and out of the way once moved. This convenient feature ensures mobility when necessary while minimizing handling risk. For acquisition, triage, and analysis work that doesn’t require hot-swap, removeable drive trays or RAID storage, the μFRED fills the need. Space saving and efficient with power to spare, μFRED is the preferred compact forensic processing alternative. All μFREDs include an UltraBay 4™ write blocker for imaging SATA, SAS, IDE, USB 3, FireWire, and PCIe suspect drives. An integrated, hot-swap USB 3.1 connected removable drive tray is available for the storage and process of case work and digital evidence. μFRED ships pre-installed with Tableau Imager (TIM) to maximize sustained forensic imaging rates through the UltraBay 4. SATA, SAS, IDE, FireWire, USB, and PCIe power and signal cables. PCIe SSD m.2 NVMe, PCIe SSD MacBook Pro (2013 and newer), server class PCIe SSD, and FireWire adapters.